We've talked a great deal in the past about how difficult it can be to balance multiple genres in one movie. One of the most prevalent "mash-ups" of genres in the past four decades has been the action-comedy. Over the years, we have seen several classic examples like Beverly Hills Cop, Men In Black, 48 Hrs, Lethal Weapon, and Big Trouble in Little China. Looking at that brief list of films, one can see that some favored action over comedy and vice versa. The thing which makes them special is that they were able to walk on both sides of the street and create truly funny moments and memorable action scenes. With that, they were able to please a wide audience. Mr. Right is a movie which would like to be on that list, but it can't quite even things out. 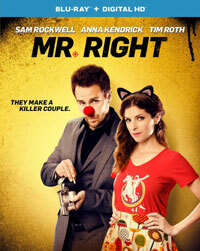 Martha McKay (Anna Kendrick) has just learned that her boyfriend is cheating on her and this throws her into a tailspin. She moves in with her friends Sophie (Katie Nehra) and Julia (Wendy McColm), who attempt to cheer her up. Meanwhile, an unconventional hitman named Francis (Sam Rockwell), hits town and demonstrates his odd method of killing those who hire him to kill someone else. He is being pursued by Hopper (Tim Roth), who is posing as a government agent. Martha and Francis run into each other, literally, in a store, and, being the odd guy that he is, Francis asks her out. So, the two spend the day together, visiting odd sites around New Orleans and drinking, and they hit it off. As Martha and Francis get to know one another, he must dodge several thugs who are trying to kill him. When two local heavies, Von and Richie Cartigan (James Ransone and Anson Mount), set their sights on Francis, he soon has baddies coming at him from all sides and Martha learns who he really is. Can she fall in love with a killer? Mr. Right comes form Screenwriter Max Landis (son of John Landis), who has had quite the career trajectory as of late, beginning with his first produced feature film script, Chronicle. Despite have had five scripts make it to the screen in a short time, Mr. Right feels like something from a novice writer in the sense that it bites off way more than it can chew. I've always felt that young writers should go for broke because, why not? But Mr. Right proves that if you attempt to shove too much into a script, it's all not going to fit. As noted above, the movie has difficult finding its balance. For starters, the two main characters may be too quirky for their own good. In Martha, we have a young woman (who is seemingly unemployed) who is very emotional and goofy to the point that it's worrisome. (She wears cat ears and longs to be a T-Rex.) Francis isn't the picture of normalcy himself, as he's an assassin who likes to wear a red clown nose win he kills. He's also been known to dance during assignments as well. He talks very fast and is jovial to everyone -- even those who are trying to kill him. The two characters are not without their charms, but their "uniqueness" begins to wear thin after a while. The movie also pushes it's action-comedy boundaries too far. Things are even further complicated by the fact that this is an action-romantic-comedy. Despite the fact that we've seen it before, I like the idea of a women unknowingly falling for a criminal. And, I sort of like the idea of the main characters falling decidedly outside of the norm. But, this is where Mr. Right gets a bit jumbled. Once Martha realizes who Francis is, her eventual reaction will not ring true with many audience members. The movie also loses sight of the comedy aspect as the film progresses. The first act has some decidedly humorous moments, but as the film grows darker, the laughs fade away. As for the action elements, things quickly get out of hand. Again, I applaud Landis for going for it, but having Hopper pursuing Francis is enough. Once the Cartigan brothers enter the picture, it gets to be too much. Soon, Francis is taking on an army of people who want him dead. All of this reminded more of True Romance, but Mr. Right takes a far more goofy approach to the subject matter. I really wanted to like Mr. Right. Sam Rockwell, who gives the impression of someone who has never studied a script, is really feeling it in this role, as he jabbers on and dances all over the place. Anna Kendrick proves once again that she can be funny, as she does a great job delivering her one-liners. I liked that the movie didn't shy away from mixing silly comedy with violent action. But, the movie never gels and the abundance of characters and scenarios soon topples the movie. If Mr. Right could have been pared down to its core, it could have been a winner. Mr. Right doesn't portray cats in a very good light on Blu-ray Disc courtesy of Universal Studios Home Entertainment. The film has been letterboxed at 2.35:1 and the Disc contains an AVC 1080p HD transfer which runs at an average of 30 Mbps. The image is very sharp and clear, showing no overt grain and no defects from the source materials. Despite the dark subject matter in the film, Mr. Right contains a nice array of colors, all of which are well-represented here. The image is never overly dark or bright. The picture is never soft, as it shows nice detail and the depth is good. The Disc carries a DTS-HD Master Audio 5.1 track which runs at 48 kHz and an average of 4.0 Mbps. The track provides clear dialogue and sound effects. The track really comes to life during the action sequences, as we get notable surround and stereo effects which deliver bullets whizzing by. This is accompanied by notable, but not overpowering subwoofer effects. The lone extra on the Mr. Right Blu-ray Disc is the 1-minute long "A Sweet Couple", which has a lot of clips from the movie, and a smattering of on-set footage accompanied by comments from Kendrick, who describes her character.